The opening ceremony was attended by 200 people. Celebration was in the balmy air of Raleigh, North Carolina as Lama Zopa Rinpoche joined members and friends of Kadampa Center in July for a week of teachings and events to consecrate Kadampa Center’s new building. On his first night, Rinpoche led a Guru Puja as center members rejoiced in his safe arrival. 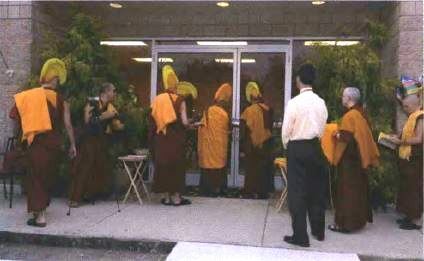 Later in the week, almost 200 people stood outside the center as Rinpoche and other senior Sangha (Geshe Gelek, Ven. Roger, Ven. Tonden, and Ven. Kunsang) led prayers leading up to the ceremonial ribbon cutting to officially open the building. After the ribbon cutting everyone moved inside the gompa where Rinpoche taught and talked about how incredible it is to be able to offer such a space for anyone to come and learn more about the Dharma. Rinpoche also blessed Kadampa Center by personally signing copies of his book, Dear Lama Zopa. Smiles were shared all around as he spoke with each person individually before writing in their book.